The NFL Draft is just about three months away. Please note, I’m really just saying that as a reminder to myself. After all, Cleveland Browns fans aren’t really too caught up in draft talk these days. This statement alone says so much more than it should about the team’s recent progress. Usually around this time of year, Browns fans are already knee deep in draft debates, likely arguing over which quarterback the team should take with its almost-always high pick. Now, thanks to the sudden rise of Baker Mayfield, Cleveland fans aren’t even remotely as riled up about the draft this time around. As a result, these next few months are going to be far less stressful than what we’re used to. So, this is what it feels like when the Browns have a franchise quarterback? To be fair, I’m not here to claim the draft is no longer valuable. Cleveland’s roster still has some holes, and with eleven picks this year, the draft represents a great opportunity to fill them. That said, the fervor we’re used to dealing with around this time of year has noticeably died down. While this is partly a result of Cleveland’s draft not kicking off until the 17th overall pick, it’s also because debating rookie QBs is suddenly a thing of the past. Think of all the time we’re getting back in our lives this winter now that Mayfield has eliminated the need for armchair quarterback analysis. It’s a welcome relief, especially when you consider all the anxiety we dealt with around this time last year. Back then, Cleveland fans were constantly arguing about which of the five incoming rookie QBs the team had to take. Were Sam Darnold‘s turnovers too big of an issue? Did Josh Allen‘s size and arm-strength out-weigh his glaring accuracy issues? Should we knock Josh Rosen for his horrible tendency of thinking on his own? When it came to Mayfield, many were questioning his size or lobbing baseless comparisons to Johnny Manziel. The debates went on and on and on, making the time leading up to the draft far more stressful than it needed to be. Again, the Browns aren’t a finished product. Still, thanks to Mayfield, we’re not spending the next three months freaking out about quarterbacks. 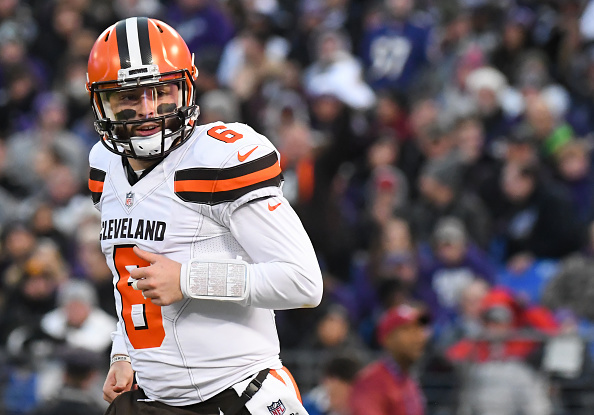 We’re not over-analyzing incoming rookies within an inch of their lives, or trying to convince ourselves Cleveland is actually set at this position thanks to Cody Kessler or Tyrod Taylor. When news broke that Justin Herbert – seen by many as one of the top QB prospects in college – was staying at Oregon, it didn’t affect Browns fans whatsoever. Mock drafts don’t spark hours of endless venting, mainly because Cleveland supporters have to scroll halfway down the page before seeing who the team is predicted to select. We don’t have to spend the next three months questioning whether or not Kyler Murray‘s size is an issue. Or if Duke QB Daniel Jones is this year’s first-round steal. The combine is barely relevant. Pro days don’t carry an astoundingly absurd level of importance. We don’t have to get wrapped up in hand size, or which quarterback can handle cold weather the best. Sure, it all sounds trivial on the surface. However, these are the kinds of things that would be the source of countless calls to local sports radio and heated Twitter threads just one year ago, and for many years before that. These are also things Browns fans would’ve already been arguing about for the past few months were it not for the team finally finding itself a quarterback to build around. Obviously, Mayfield represents more for Cleveland than just a reason to disengage from annual draft talk. Still, considering how insane it typically gets around this time of year, this specific benefit is really standing out right now. And it’ll keep doing so during a far more drama-free draft season for Browns fans.